Select from the following climbing activities and options. 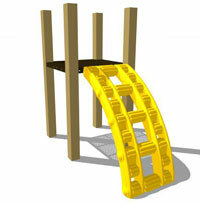 These climbing units are sure to be amongst the most popular play activities at the playground! 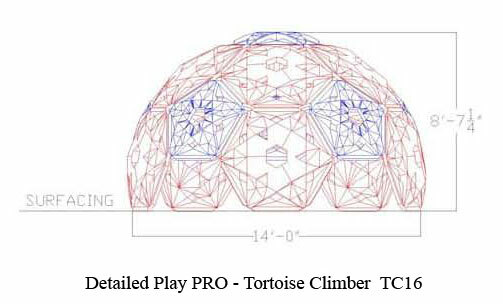 A large selection of tortoise climber layouts are made possible by coupling varying combinations of individual pentagon and hexagon shaped panels. These rotationally molded first-quality polyethylene components are available in a wide range of color choices and all brackets and hardware required for installation are included. 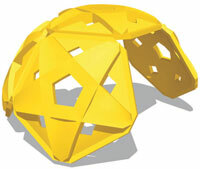 Pentagon: 30lbs, 53"x51"x9". Hexagon: 45lbs, 60"x65"x10". Additional design layouts are available, call or email for further information. (5) Hexagon, (5) Pentagon Panels. 375lbs. (5) Hexagon, (6) Pentagon Panels. 405lbs. (10) Hexagon, (6) Pentagon Panels. 630lbs. 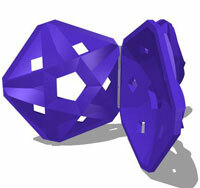 Tough polyethylene molded rock holds. Set of (4). 3lbs. Nothing tops the realism of these composite sand hand holds. Set of (10). 6lbs. 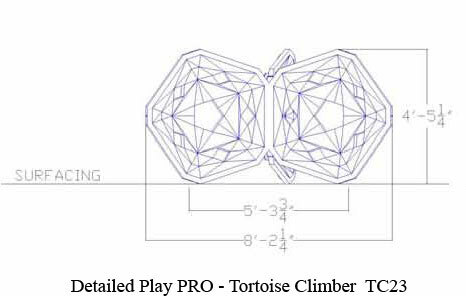 A chain link style climber for exceptionally fun climbing into 48" or 60" deck heights! Roto-molded plastic, deck not included. 34" wide, 70lbs. 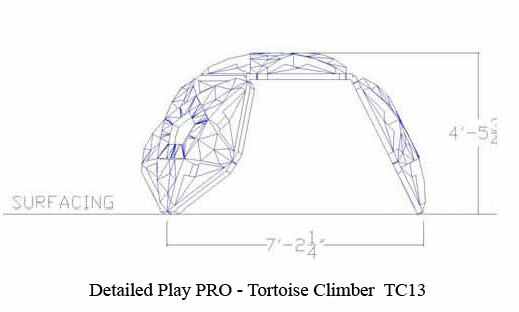 A chain link style climber that steps up to 3 different heights to challenge different age groups. Roto-molded plastic and powder coated metal posts. 295lbs. 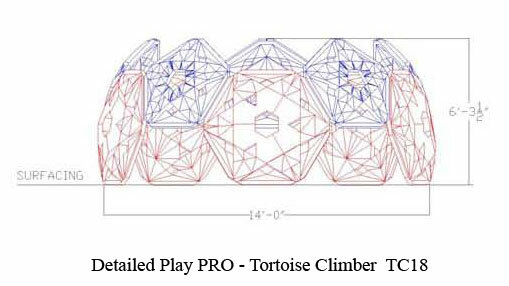 A chain link style climber that steps up to 4 different heights to challenge different age groups. Roto-molded plastic and powder coated metal posts. 395lbs. Here is a fun climber that is educational too! 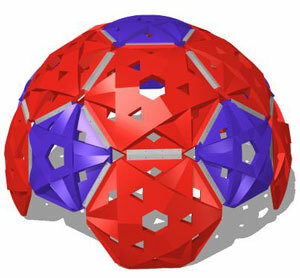 Roto-molded plastic. 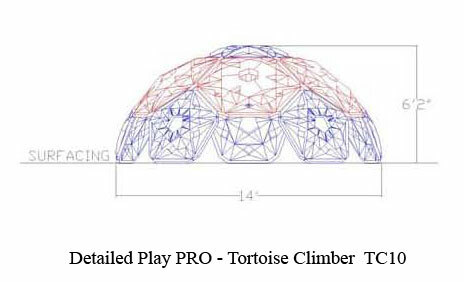 Rotate climber 180 degrees and it can fit either a 48" or 60" deck height. 85lbs. Children can climb their way straight into stone age fun with this tough roto-molded climber! Fits 36" to 48" deck heights. 65lbs. This free-standing climber is a child's way to the top! High-strength chain and rungs in two separate configurations create a great single challenge or a race to the top! 325lbs. These coated steel trapeze bars are tough enough for any playground jungle! Length 20", complete with eye hooks. 2lbs. These heavy duty trapeze rings are tough. Heavy coating goes all the way to the connection point. 1lb. 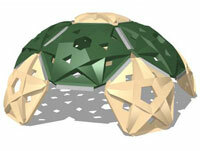 Made from soft pour in place surfacing material, these roundedhead mushrooms have an 18" diameter top. Comes complete with ground anchors. 39lbs. Made from recycled rubber, these round stepping posts have a 10" diameter. Comes complete with ground anchors. 16lbs. These non-slip roto-molded pads are mounted on steel tubes with powder-coated finish. 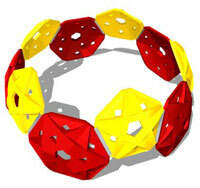 They are great for building coordination skills. 80lbs. This is the sturdy version of a rope climb. Uni-welded chain with matte brown PVC finish. Includes clevis fasteners and powder coated mounting bracket. Chain and rungs are brown, mounting bracket black. Fits 24" to 60" deck heights. 40-1/2" wide x 96" length, 45lbs. Its all in the wrist! This new ladder works the upper body in a whole new way. All overhead events fit in a 37" to 41" opening because of versatile wood receivers included with these overhead ladders. 94lbs. This traditional horizontal ladder provides the best fun. The horizontal ladder no playground should be without. All overhead events fit in a 37" to 41" opening because of versatile wood receivers included with these overhead ladders. 94lbs. A playground favorite! These sturdy polished aluminum handles come with hangers and chain. The trapeze rings are attached to the chain with clevis fasteners for increased safety. All overhead events fit in a 37" to 41" opening because of versatile wood receivers included with these overhead ladders. 94lbs. The horizontal ladder for children ages 5 to 12. Big handles make gripping easier. All overhead events fit in a 37" to 41" opening because of versatile wood receivers included with these overhead ladders. 96lbs. This double parallel bar presents even more of a challenge and is just great fun. All overhead events fit in a 37" to 41" opening because of versatile wood receivers included with these overhead ladders. 45lbs. Children glide easily along this high quality track ride. Aluminum housing protects track mechanism providing years of track riding fun! Heavy duty handle with self-braking mechanism keeps handle from being thrown end to end. 10ft length. 125lbs. Little kids love to corkscrew their way down on this exciting climber. All steel construction with powder coated finish. Fits 24" to 72" deck heights. 95lbs. Tree climbing fun begins with this imaginative climber! All steel construction with powder coated finish. Fits 24" to 72" deck heights. 85lbs. The funnest fastest way down from any deck! All steel construction with powder coated finish. Fits 24" to 72" deck heights. 60lbs. An Alpine event to keep the kids climbing for hours! All steel construction with powder coated finish. 345lbs.